Sometimes it can be more convenient to work with WordPress on your local machine. 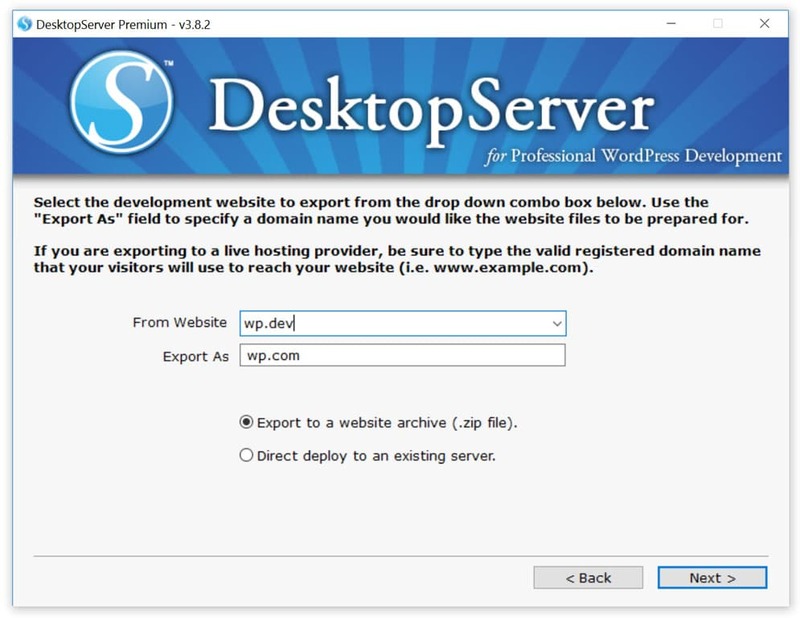 Today we want to share with you an awesome WordPress product, DesktopServer from ServerPress, which can make installing WordPress locally a complete breeze. You can literally launch a new development install in a matter of seconds with a simple click of a button. It also fully supports multisite and WP-CLI! You might have used WampServer, XAMPP, or MAMP in the past; but you haven’t seen anything like this yet. 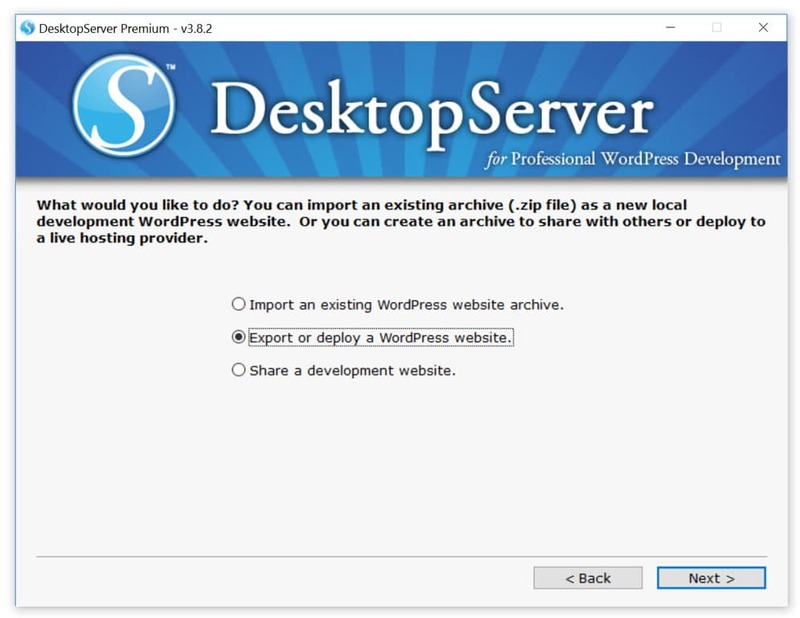 Check out our tutorial below on how to install WordPress locally with ServerPress. And yes, it works on both Windows and Macs. We have a staging environment here at Kinsta that allows for easy development and testing, but installing locally also has some advantages. Perhaps you are traveling and don’t have access to Wi-Fi, this then requires a local install to continue working. Also for manipulating files and local editing it can sometimes be faster, or if anything, there is usually less setup involved to get it up and running. This is where DesktopServer can come in handy. 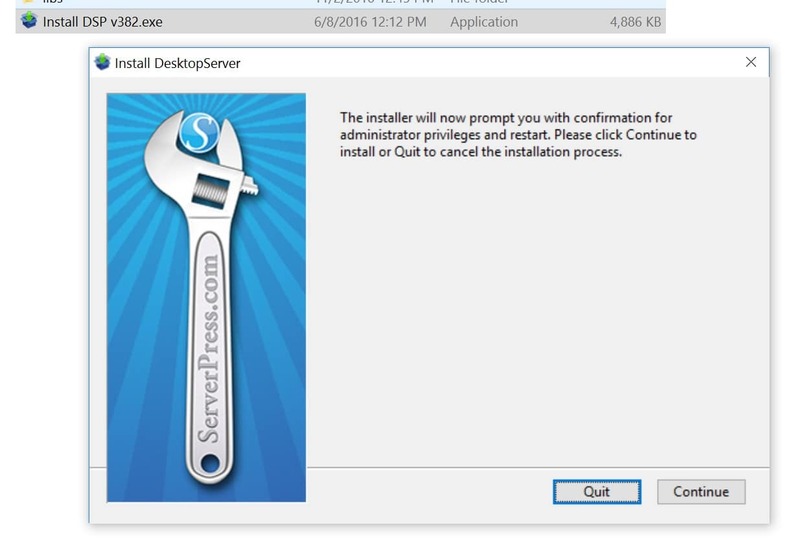 Note: We don’t have any association with ServerPress, we simply really love their tool! When you want to install WordPress locally you need to get a local AMP stack setup on your machine. In the case of WordPress, AMP stands for Apache, MySQL, PHP. These are all software needed to mimic what a managed WordPress host would be running for you on their web server. Usually people will install WampServer, XAMPP, or MAMP to get up and running. 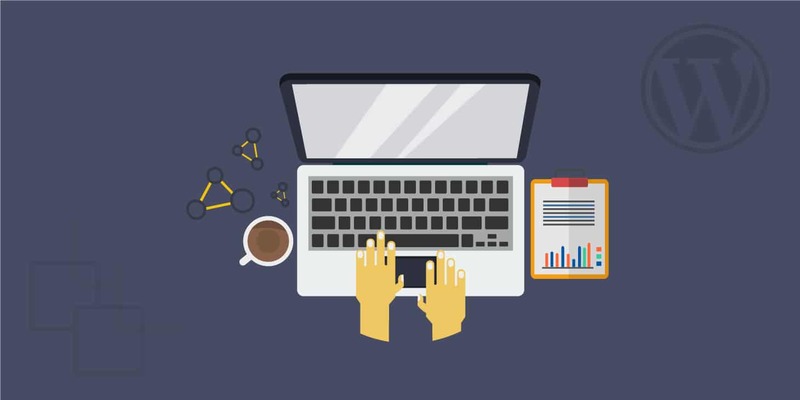 While these are great tools they still can be a little tedious, as they are designed to work with a variety of other software and tools. DesktopServer was actually designed and optimized specifically for WordPress as a local AMP stack. 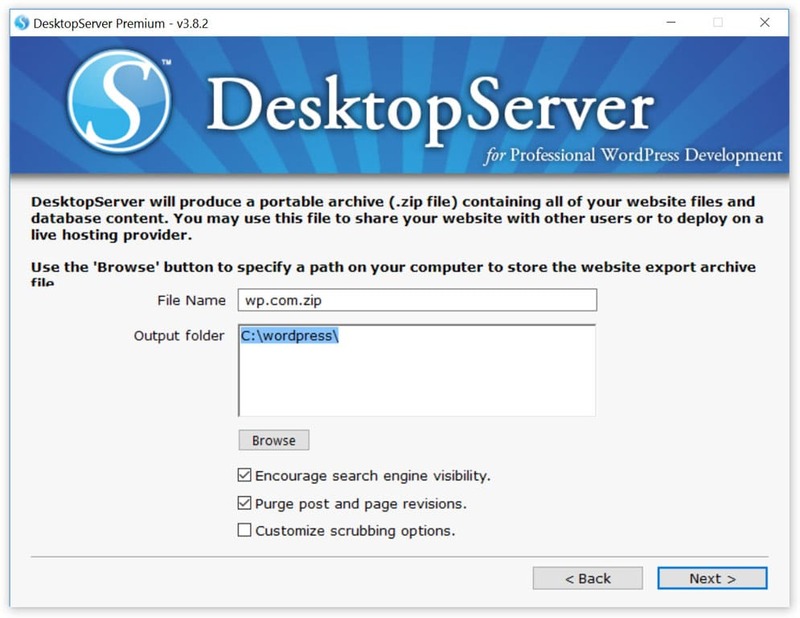 ServerPress has both a free version and a premium version of DesktopServer which is $99.95 a year. The premium version includes a few advanced capabilities such as multisite support (hooray! ), importing and exporting 3rd party backups, direct deploy to live site, a bypass login plugin, and more. So depending on your needs you can choose which version fits you best. If you just need to do some quick testing, the free version works great. We are using the premium version below in our example. 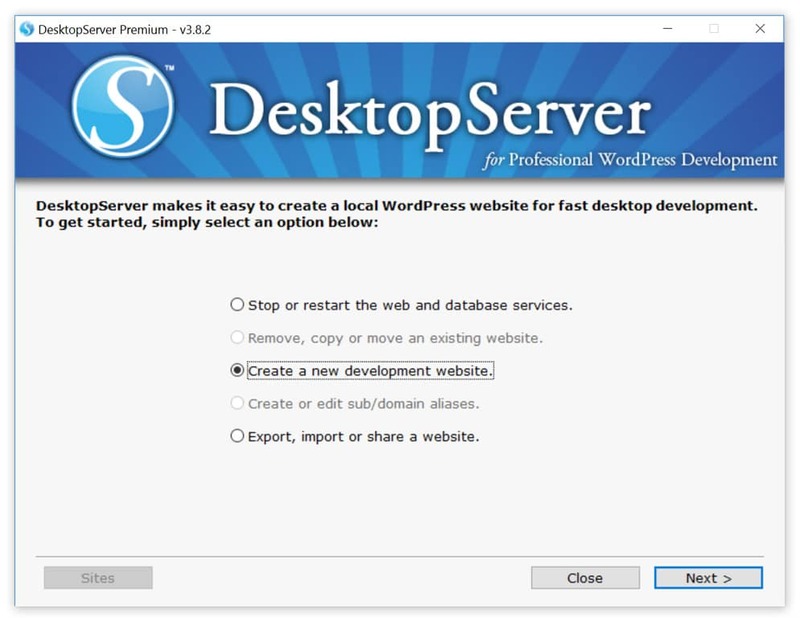 To install WordPress locally you will first need to download DesktopServer from their website. There is both a Windows (XP, Windows Vista, 7, 8, 10) and a Mac version (OS X 10.6.x-10.11.x). They are also currently working on a Linux version. Note: We will be using the Windows version in our example. 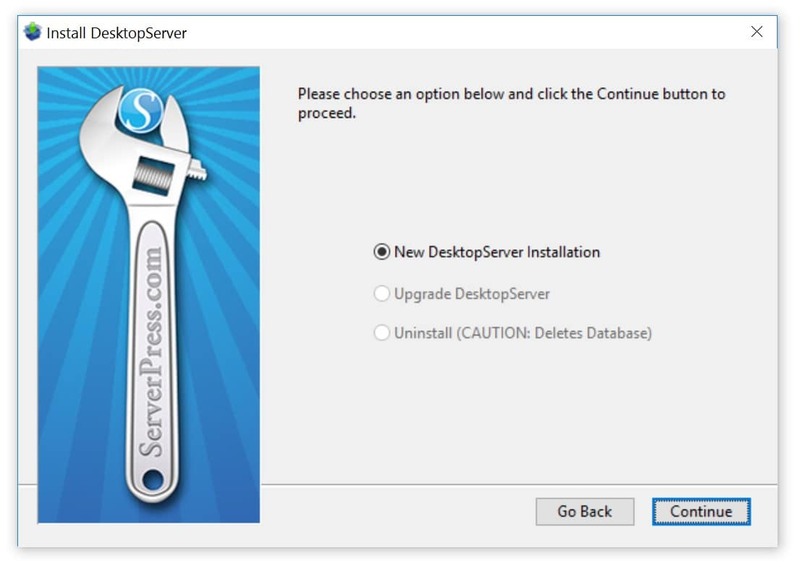 Launch the installer and click on “Continue” to install with administrative privileges. Then accept the terms of service. 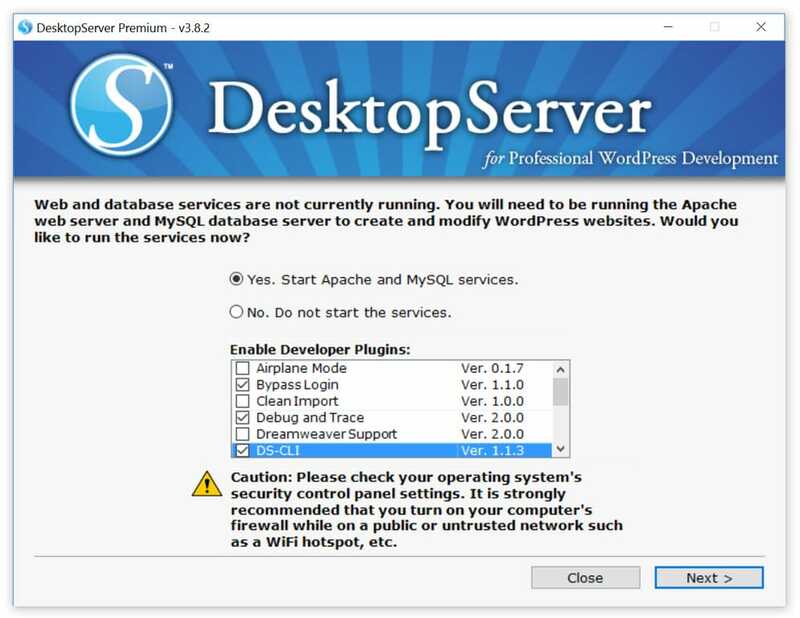 If this is your first time using it by default the “New DesktopServer Installation” option will be checked. Click “Continue.” It will then take a few minutes while it configures everything. 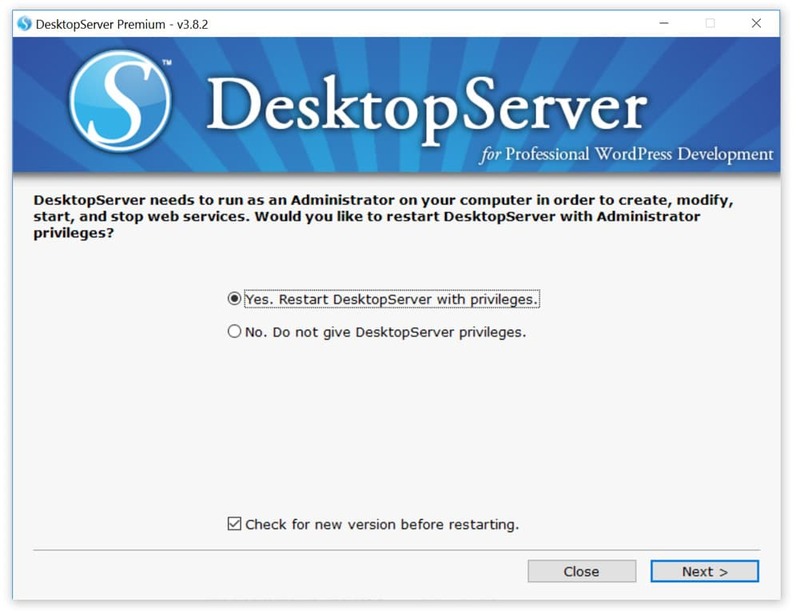 After the installation has finished you can launch DesktopServer.exe from the “xampplite” folder it has created on the root of your C:\ drive. Here is a quick rundown of the developer plugins you can use when you install WordPress locally. 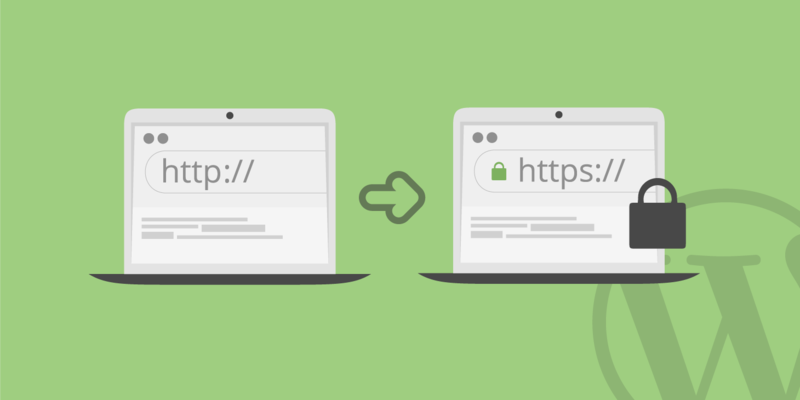 We highly recommend the bypass login and DS-CLI plugins. Airplane mode: Control loading of external files when developing locally. Bypass login: Allows developer bypass of login credentials via quick selection of any of the first 100 usernames in a combobox. Dreamweaver Support: Enables automatic Dreamweaver project file creation and WYSIWYG mode when working on template files and style.css. DS-CLI: This is an enhanced, cross-platform, command line interface for professional developers. Easily use CLI, Composer, Git, and PHPUnit. NodeJS and NPM are included to allow installation of GRUNT, Gulp, and other Node dependencies. DS-Deploy: Used to move a site from a local DesktopServer install to a live server. InnoDB Autoconvert: Convert a site’s tables to InnoDB on Create, Copy, Move, and Import operations. Local Admin Color Bar: Changes the Admin bar color. Mailbox Viewer: Provides quick developer offline viewing of mail delivery services. You then have to pick your site name, which will also be the local address. 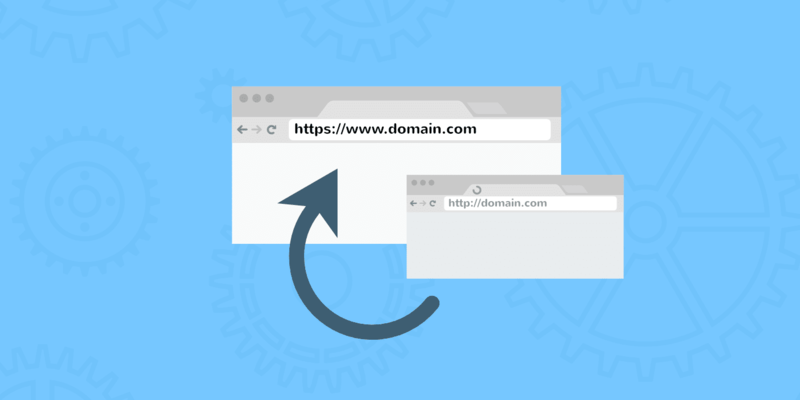 We are calling ours wp, so our development URL ends up being wp.dev on our local machine. DesktopServer allows you to actually create different blueprints which is awesome, it is almost like a pre-built template. In our case, we simply want a fresh install. 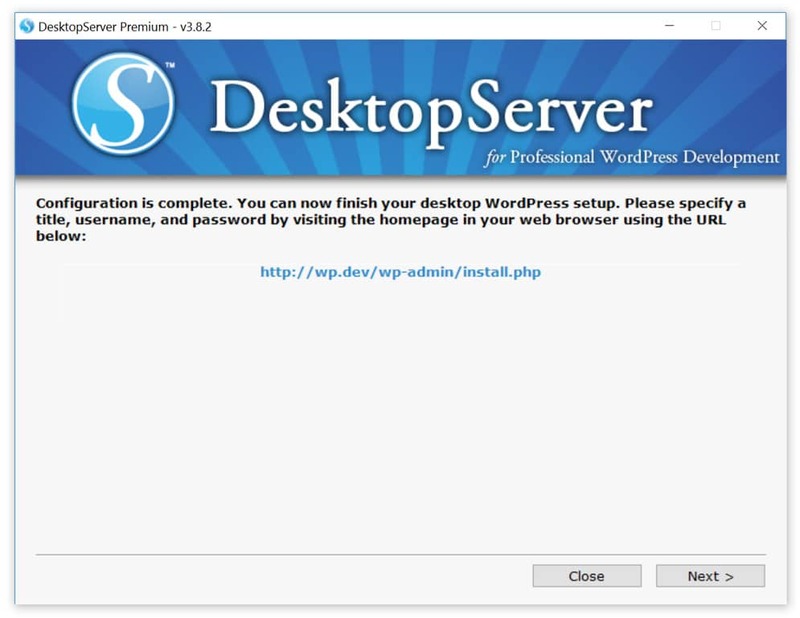 DesktopServer always has the latest and greatest version of WordPress as the default blueprint. This means you don’t have to worry about manually downloading it from the repository and unzipping it. 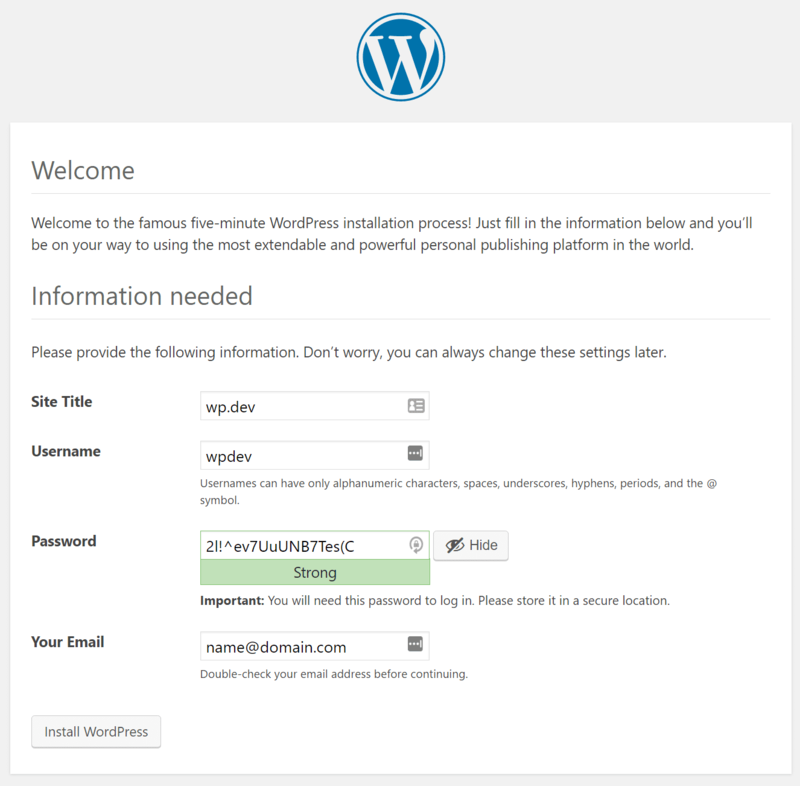 It will then display the URL of your local WordPress install. Click on that to finish up the installation. If you get a blank screen or error by clicking on the link you might have a conflict on port 80. This happened to us because we were running Skype. It is a common problem with local AMP stacks. 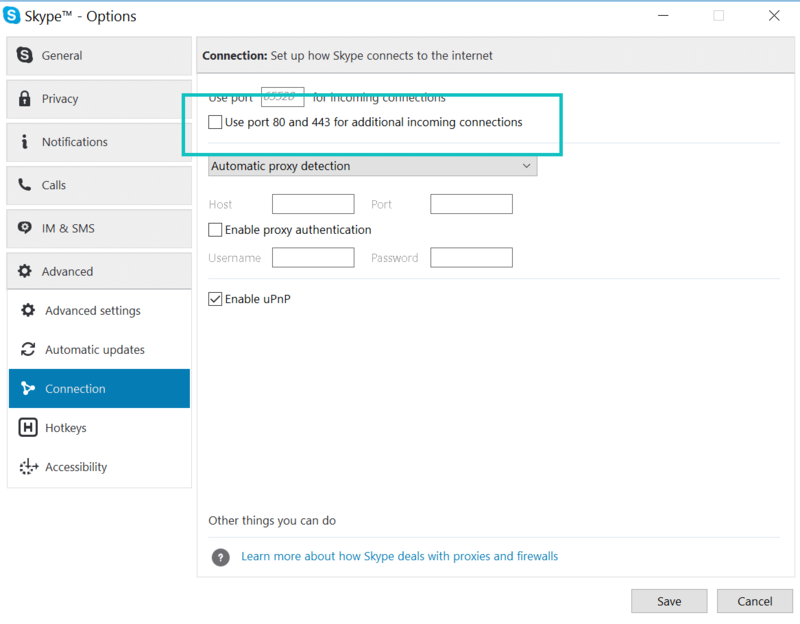 This is simple to fix, you just have to disallow Skype from using port 80 for incoming connections. Under the “Advanced > Connection” options in Skype simply uncheck the “Use port 80 and 443 for additional incoming connections. And that’s it! You just installed WordPress locally and your site is up and running. You can now browse to your local install and test away. In our case we browse to wp.dev in our browser’s address bar. One neat little feature is because we selected the “bypass login” plugin upon setup there is a dropdown in which we can select our admin and it automatically logs us in. Obviously, you won’t use this on a production site, but super handy for dev environment. Here are some additional features and things to be aware of. Because of how Windows handles its file permissions you might or might not see a message upon logging in about WordPress failing to update. 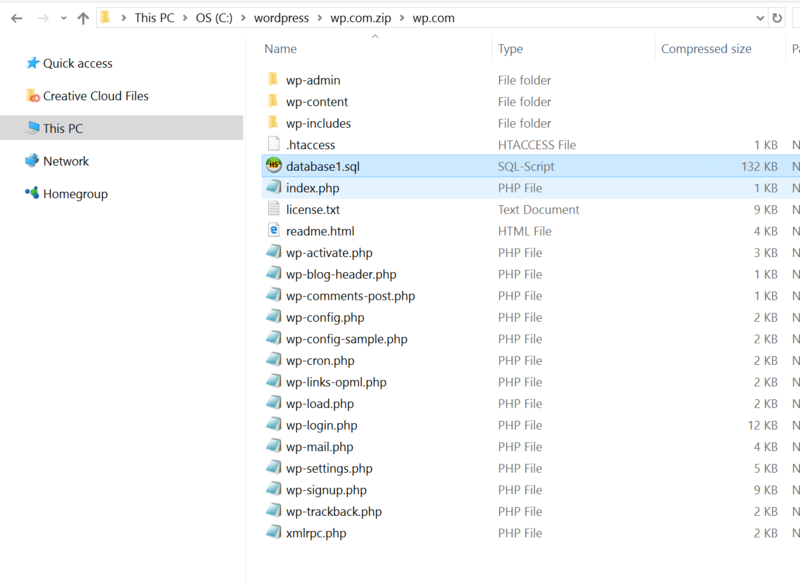 To fix this simply open up command prompt as administrator and run the following command within your WordPress directory folder. See more details on this issue. 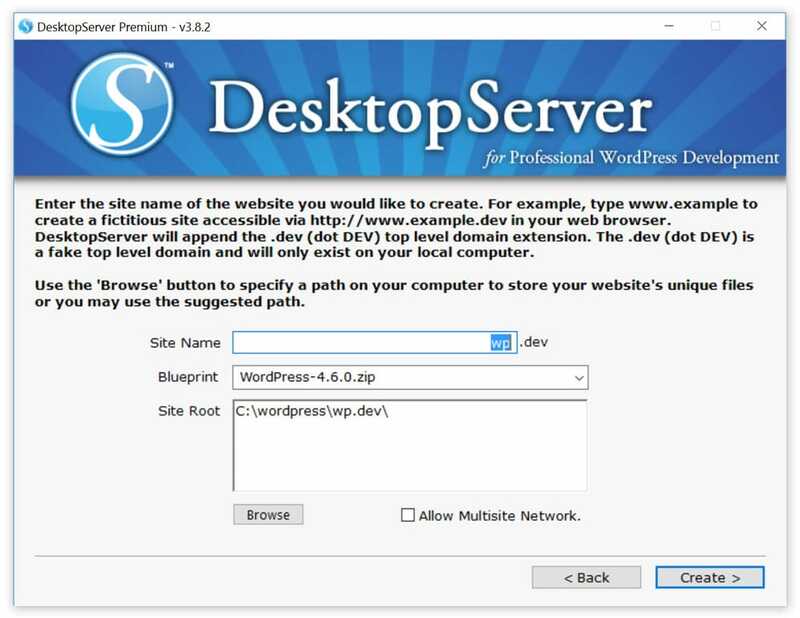 To create additional WordPress sites or edit them simply launch the DesktopServer.exe again. You can stop and restart services, create new sites, edit them, export and import, etc. To access PHPMyAdmin you can click on the “Sites” button on the bottom left. Alternatively, you can enter localhost into your browser’s address bar. This will bring up the administrator interface on the localhost. Here you can get the links to all of your WordPress sites, dashboard links, and also PHPMyAdmin links. 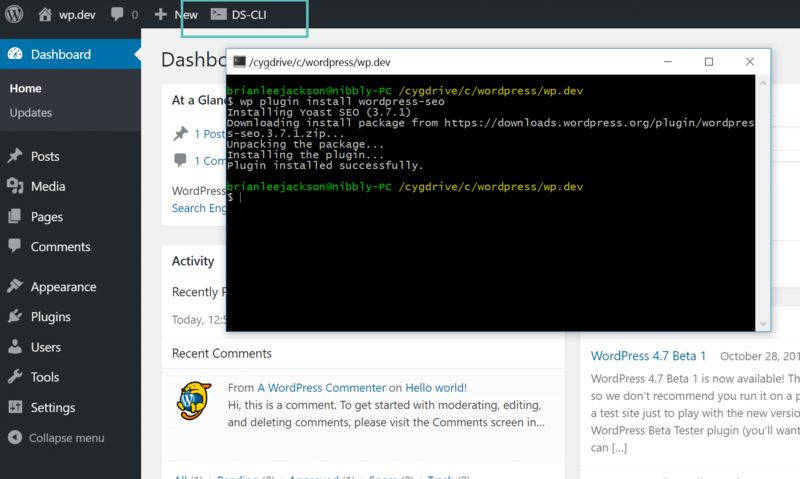 Another awesome feature is ability to simply launch WP-CLI or DS-CLI as they call it with a single click. If you selected the “DS-CLI” option in the setup above then there will be a link for it within your dashboard. Simply click on it and you can start firing up WP-CLI commands. In our example below we did a quick install of Yoast SEO. Another great feature is the export feature which allows you to export your WordPress site directly to a live site or .zip file. To do this follow the steps below. Note: You will need the premium version for this. Select your output folder. This exports all of your website files and database. You then have a .zip file which contains all your files and the .sql database. You can then follow our WordPress migration guide to upload your site to Kinsta. 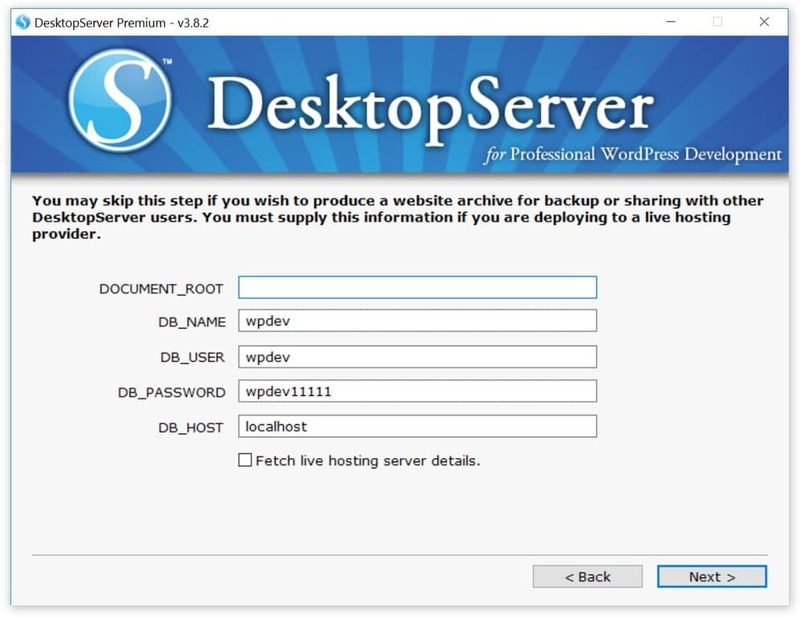 DesktopServer also works great with symlinks (symbolic links) and or mklinks. 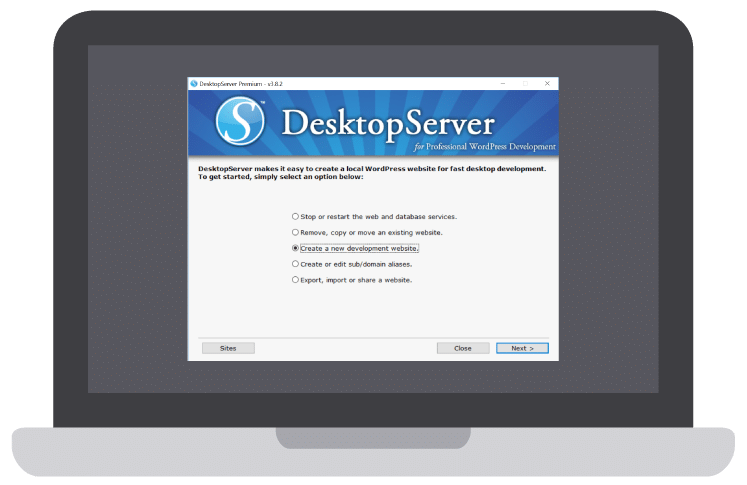 We had issues when trying to use mklinks in Windows with other 3rd party local staging tools, and with DesktopServer they simply worked right out of the box. Symlink allows you to create shortcuts and references to another file or folder in an alternate location. As you see DesktopServer is pretty awesome. Once installed it is so fast to create and delete new development environments. We decided to time ourselves from creation of a new site to the first login into the WordPress dashboard. It only took us 1 minute and 9 seconds to install an additional WP dev site and be inside working! 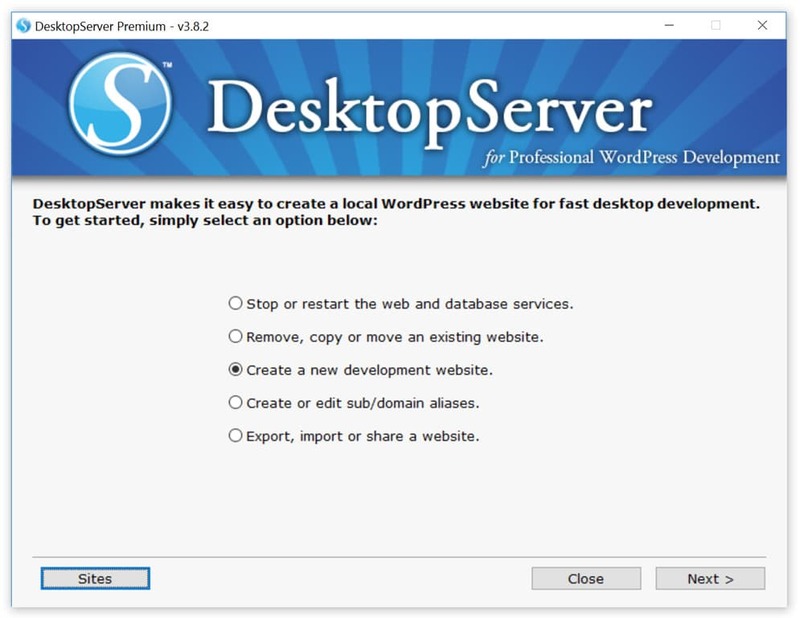 Whether you are a beginner or a more advanced WordPress developer, we highly recommend taking a look at DesktopServer. They also have an extensive knowledgebase. 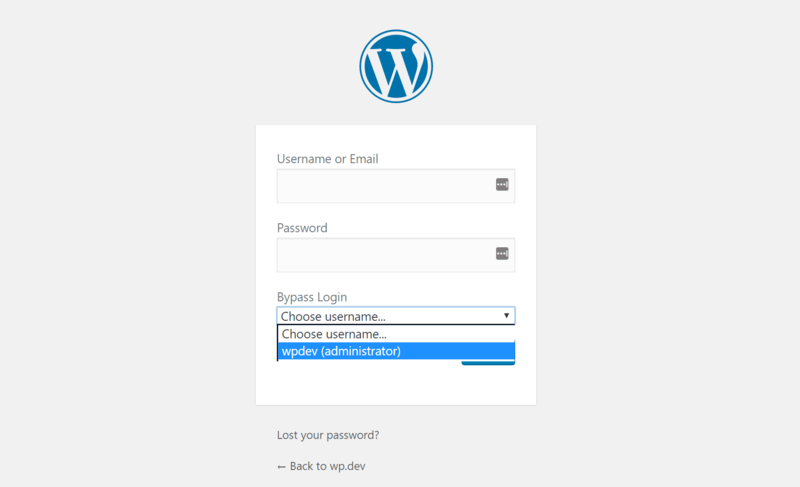 As far as ways to install WordPress locally, it can’t get much easier than this. Do you have any experience using it? If so we would love to hear your feedback below. Thanks for the detailed tutorial Brian! Quick question, have you ever used it with BackupBuddy? I was thinking of using the free version of Desktop Server and then use BackupBuddy to migrate the site to the server, curious to know if that will work in a local dev environment with Desktop Server. I think AMPPS is a much better alternative – http://www.ampps.com. You can create an unlimited number of websites and contains the full Softaculous suite of apps found on most Linux CPanel admin backends. Thanks for the share Ateiyev! AMPPS is definitely another good alternative. This is an excellent article and I’m very happy with the local WordPress installation you have recommended!